Recently I started a new project to build QA system for Mindvalley. After a short discussion with my colleagues we decided to use the 2011 jeopardy winner (Watson). As you may know Watson is a question answering computer system capable of answering questions posed in natural language, it developed in IBM’s DeepQA project by a research team led by principal investigator David Ferrucci. IBM also released it’s cloud platform IBM Bluemix in 2014. It supports several programming languages and services as well as integrated DevOps to build, run, deploy and manage applications on the cloud. 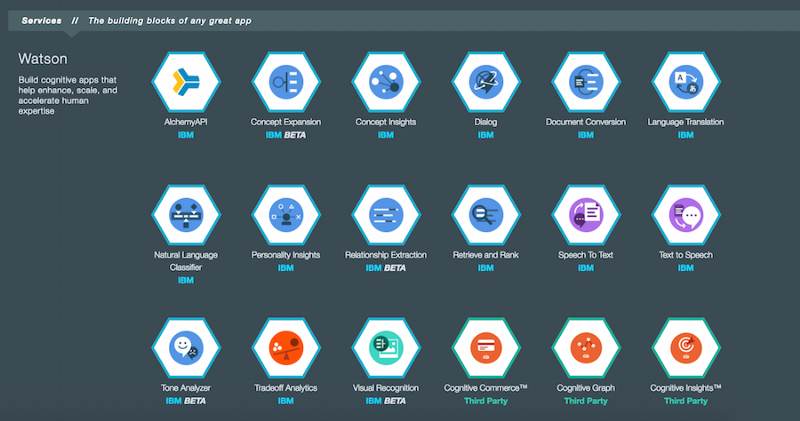 And of-course Watson API’s are accessible in Bluemix platform. But unfortunately, it is not as easy as advertised by IBM. In past IBM offered IBM Watson Question and Answer (QA) but in summer of 2015 this service replaced by four new services to support customize and embed Q&A applications. Natural Language Classifier; allows you to Interpret and classify natural language with confidence. Dialog; allows you to script a conversation and help walk a user through a process. Retrieve and Rank; allows information retrieval with a machine learning model. Document Conversion; takes documents and ‘chunks them up” into smaller answer units to return as passages based on your input data and requirements, you can choose one or combinations of these services to build a comprehensive and robust system. I decide to use combination of Document Conversion and Retrieve and RankServices. Document conversion service used to transform documents into Answer Units, and use those as input to train the Retrieve and Rank Service. What is Watson? Watson is an artificially intelligent computer system capable of answering questions posed in natural language, developed in IBM&#39;s DeepQA project by a research team led by principal investigator David Ferrucci. Watson was named after IBM&#39;s first CEO and industrialist Thomas J. Watson. The computer system was specifically developed to answer questions on the quiz show Jeopardy! In 2011, Watson competed on Jeopardy! against former winners Brad Rutter and Ken Jennings. Watson received the first place prize of $1 million. How did it Work? Watson had access to 200 million pages of structured and unstructured content consuming four terabytes of disk storage including the full text of Wikipedia, but was not connected to the Internet during the game. For each clue, Watson&#39;s three most probable responses were displayed on the television screen. Watson consistently outperformed its human opponents on the game&#39;s signalling device, but had trouble responding to a few categories, notably those having short clues containing only a few words. And then, what happened? In February 2013, IBM announced that Watson software system&#39;s first commercial application would be for utilization management decisions in lung cancer treatment at Memorial Sloan–Kettering Cancer Center in conjunction with health insurance company WellPoint. IBM Watson&#39;s former business chief Manoj Saxena says that 90% of nurses in the field who use Watson now follow its guidance. Now we can use list of answer units for training Retrieve and Rank system. This service helps users find the most relevant information for their query by using a combination of search and machine learning algorithms to detect “signals” in the data. Built on top of Apache Solr, developers load their data into the service, train a machine learning model based on known relevant results, then leverage this model to provide improved results to their end users based on their question or query. To use the Retrieve and Rank service, you must create a Solr cluster. A Solr cluster manages your search collections, which you will create later. The response includes cluster_id and the cluster availability status. The cluster must be ready before you can use it. it takes about few minutes to become ready but you can check the status through API. After cluster become ready and before you can create collections you need to configure your cluster. The Solr configuration identifies how to index the documents so that you can search the important fields. you can download the sample solr config from here I may write separate post about solar config latter. you can upload one or many configuration to your retrieve and rank service. A Solr collection is a logical index of the data in your documents. A collection is a way to keep data separate in the cloud. you need to assign one of the uploaded configuration to your collection. Now everything is ready to index (add) the question and answers generated by Document Conversion service into the collection. Ground truth is the collection of questions that are matched to answers. For the Retrieve and Rank service, you label the answers with their relevance to the question. The relevance label helps the ranker determine which features are the most useful. The questions, answers, and relevance labels are combined to create training data. we need to upload the training data to create and train a ranker. The file must contain at least 49 unique questions. The number of records must be at least 50 times the number of fields that are identified in your Solr configuration. For example, if your collection defines five fields, you must have at least 250 records in your training data. At least two different relevance labels must exist in the data and those labels must be well represented. A label is well represented if it occurs at least once for every 100 unique questions. The answer ID is the unique key of a document which is indexed into your collection. The relevance label is a non-negative integer (between zero and some upper limit). Higher numbers indicate higher relevance. The script creates a file in your working directory called trainingdata.txt. That file is used to create the ranker. When the script is finished, the script window displays a new ranker ID and its status. We’ll need it when we rerank results at runtime. Let’s test the system. you can search your collection with or without ranker. searching without ranker is useful to create a ground truth. you can collect the user satisfaction level, regarding to the system answers in order to train your system and improve the results. you can update your ground truth based on user input and repeat step 6.